The R-JACK Ethernet Assemblies provide efficient, comprehensive and affordable solution to Ethernet connectivity in harsh and environmentally challenged applications. R-JACK Ethernet components feature a smaller mechanical footprint (receptacles, dust caps, backshells), occupying less panel space, allowing higher density. R-JACK Ethernet receptacles feature 100% transversely sealed (IP-68) configurations as a standard product design, preventing dust, water or moisture penetration, with or without dust cap or plug engagement. 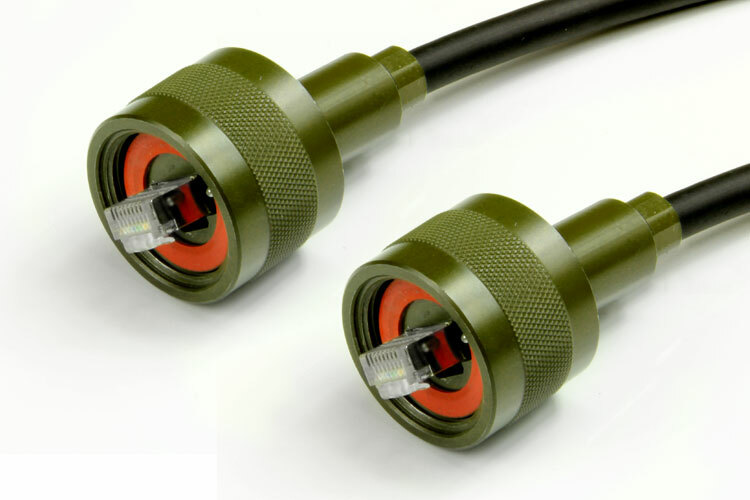 R-JACK Ethernet receptacles offer comprehensive shielding and grounding effectiveness capable of sustaining higher data transmission rates as well as Electro-Magnetic Conductance (EMC) for military applications. Our assemblies feature PUR Energy Chain® cable, shielded, oil-resistant, UV-resistant, flame retardant, abrasion and tear resistant cable.